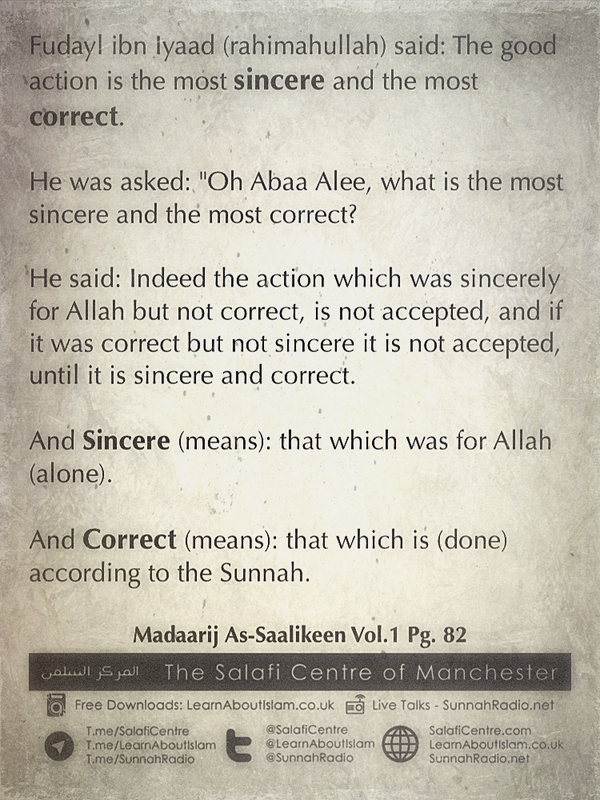 The Goal: Purified Intentions & Being Truthful To Allaah In All What We Say Or Do Will Determine Everlasting Success! The Goal: Purified Intentions & Being Truthful To Allaah In What We Say Or Do, Regardless How We Are Seen Due To The Virtuousness & Piety of Those We Are Associated With In This Worldly Life; For We Will All Return To Allaah As Individuals! Q: What is the meaning of Ikhlaas? And if a servant intends something else with his worship, what is the ruling [on that]? A: Ikhlaas means to be free from Shirk. That the person’s deeds, his intention and goal are sincerely for Allaah’s Countenance (The Mighty and Majestic)-neither to associate partners with Allaah through them (i.e. his intention and deeds) nor to show off (in order to be seen) or to be heard. Neither aiming (to please) other than Allaah (The Mighty and Majestic) through them (i.e. 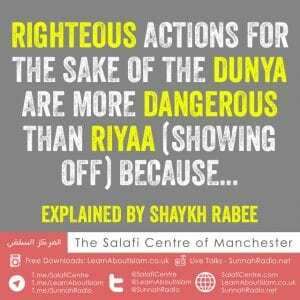 his intention and deeds) nor seeking the dunya (i.e. worldly material), nor the praise of people, thus a deed becomes one (carried out) sincerely for Allaah’s Countenance because Allah does not accept deeds except those that are sincerely (done) for His Countenance. A Small snippet of benefit from Shaykh Muhammad bin Haadi and Shaykh Abdullah Bukhari – on Saturdays April 5th – regarding being sincere and buying books. May Allah make us from those who strive hard and seek knowledge, and act upon it.